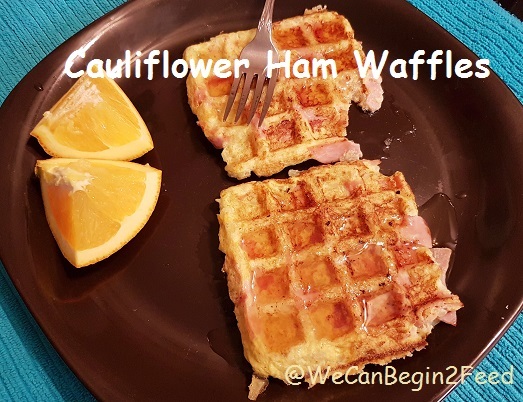 We can begin to feed...: Cauliflower Ham Waffles... Low carb and low fat too. Delicious! For the past few months I have been doing a lot of experimenting with different kinds of foods, fine tuning my diet in order to find out how various foods and drinks affect me... my mood, my athletic performance, my sleep, my weight, and the amount of inflamation they cause. Sadly, I have discovered that red wine affects me quite negatively... I do not sleep well, and I get cramping in my legs during the night that even an evening dose of magnesium no longer prevents. On a positive note, I have also discovered that a low carb, even to the point of being in ketosis, agrees with me very well. I thrive on healthy fats... avocado, nuts and nut butters, cream and oils... coconut, avocado and olive are my favorites. I love making my own nut butters. I like leafy green and crunchy veggies... and the occasional bit of fruit. I do not miss grains and grasses and as much as I do like the taste of them, I am not missing squashes and beans. I do occasionally have a high carb dayl.. perhaps a bit of sushi or some edamame and a Starbuck's specail coffee, and then happily get right back on a low carb regimen the next day. It is all good. I am happy and in a groove. This morning I was wanting something substantial for breakfast and knew that I had a bit of riced cauliflower in the crisper that needed to be used or tossed soon, so I put together these Cauliflower Ham Waffles pretty quickly. They are low carb, and actually low fat too. I did add some sugar free syrup on top before I ate them, but next time I think I will go the savory route and add a bit of salt and them some sriracha or even salsa. If you are a keto enthusiast, add some avocado or olive oil to the mix. 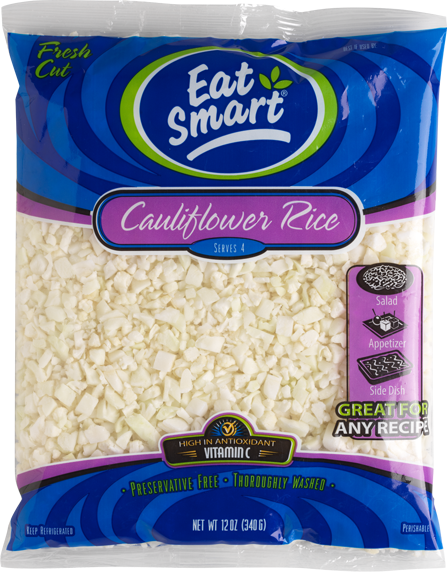 I have been purchasing cauliflower already riced... but if you have a head of cauliflower, break a few florets off and put them in your blender or food processor and whizz till they are broken down into large rice shaped crumbles. Place cauliflower rice in a medium microwave bowl (I used a glass measure cup) and cook on HIGH in mike for 3 minutes. Remove from mike and allow to cool for a few minutes. 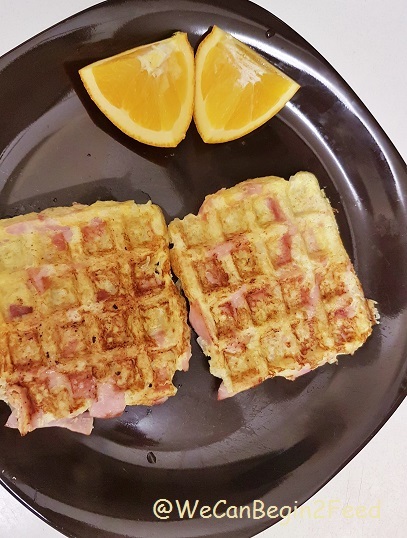 Turn on waffle iron and allow to get hot. I use a nonstick spray in mine. Cut ham into small pieces and add to cauliflower. 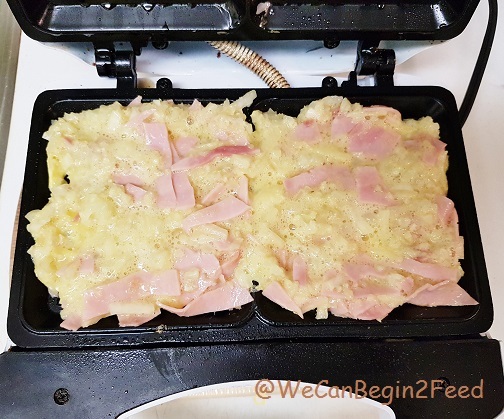 Combine cauliflower, egg and ham and pour mixture into waffle iron. Cook about 5 minutes till outside is crispy and browned, and remove to plate. Weight Watchers Freestyle Smart Points = 1. * The nutritional information for the ingredients I used. Yours will depend on your own ingredients. This is the cauliflower rice I am currently using. I am including this picture to illustrate the size and shape that the cauliflower rice crumbles will look like if you make your own in a blender or food processor. Picture is taken from the Eat Smart web site. 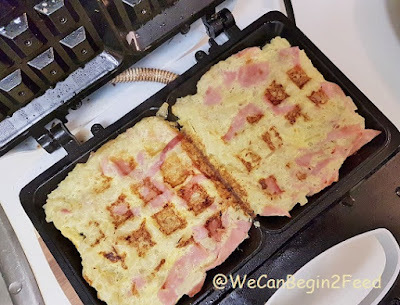 Mixture in waffle iron before cooking. You can see that it is fairly thick and not runny so does not make a mess in the waffle iron. Waffles slightly browned, and ready to easily remove from waffle iron. Waffles are plated and ready to top... or even eat just as is. Enjoy! What do you think? If this is something you might enjoy, I hope you will consider sharing or Pinning! You are a genius! This looks delicious!